One of the small overlooked gems of last year's holiday season was this film based on a true story of the Wiley College Debate Team. In the Jim Crow south, this small black college was unbeaten and even went up against USC and won (although this was changed to Harvard University in the film). Directed by and starring Academy Award winner Denzel Washington, the film was nominated for a Best Picture Golden Globe award. It was the collaboration of many great talents; in addition to Washington, it also stars the estimable Forest Whitaker, John Heard and Kimberly Elise and was produced by the Weinsteins and Oprah. The story of the underdog debate team, inspired by their charismatic professor, to overcome the stacked deck of prejudice and racism to succeed combines elements of The Color Purple, Dead Poet's Society and Rocky. Unfortunately, despite the fine pedigree of talented people who brought this uplifting and inspirational story to screen, it ends up being a good, solid, competent film which just misses the mark of greatness. Washington's directorial debut with Antwone Fisher was a fine example of his ability to craft a touching, heartfelt story with emotional depth and resonance. I sobbed through that movie. My friend asked me which part of the movie made me cry. "All of it!" I blubbered. The Great Debaters, lacked that poignancy and pathos and failed to reach me in that way. I did puddle up a bit at the climatic ending. But the ending should have built to a crescendo that would leave the viewer cheering as well as tearing up. I think part of the problem is that the debate scenes, which should have been the meat of the movie, were not as passionate or as persuasive as they could have been. The dialogue throughout, with the exception of Washington's character of Melvin Tolson spouting the poetry of Langston Hughes or Gwendolyn Brooks, was somewhat flat--even in the debate scenes. But the major problem was a lack of a point of view. In telling the story of the debate TEAM, so much energy was expended in giving each character--Tolson, James Farmer Jr., James Farmer Sr., Samantha, Henry--a balanced part in the tale that the lack of focus diffused the power of the experience. I think telling the story from James Farmer Jr.'s point of view--showing the conflict between his admiration for his brilliant and proper father vs. his idolization of his charismatic and activist teacher, his growth from dutiful son and student to strong, independent thinker, his progress from a background role as team researcher to champion debater--would have given the film more power and emotional depth. The role of the 14 year old prodigy was played by Denzel Whitaker--no relation to either of his co-stars although Forest does play his father in the film and he was actually named after Washington. He, as well as Nate Porter, Jurnee Smollett and Jermaine Williams, do a fine job as the members of the historic debate team. Whitaker's character was based on the real James Farmer Jr., who later founded the Congress of Racial Equality (CORE), but the other members of the debate team were amalgamations. The film's soundtrack features combines the musical influences of juke joint blues, gospel and early jazz swing with performances by Sharon Jones, the Carolina Chocolate Drops and Alvin Youngblood Hart. The care in the musical selection by G. Marq Roswell and Adam Swart does a lot to help create the feeling of authenticity as well as enhance the telling of the story. 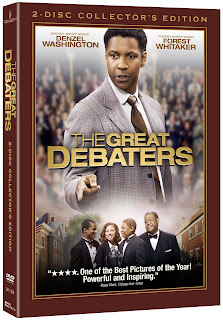 It was the intent of the filmmakers to show how these debate teams were the genesis of the Civil Rights movement, and in that they succeeded. It's a high-class product--even if it doesn't quite deliver on being the rousing tribute to its inspiration that it could have been.